Patrick Hruby: Who Ruined the NFL Players Union? Who Ruined the NFL Players Union? 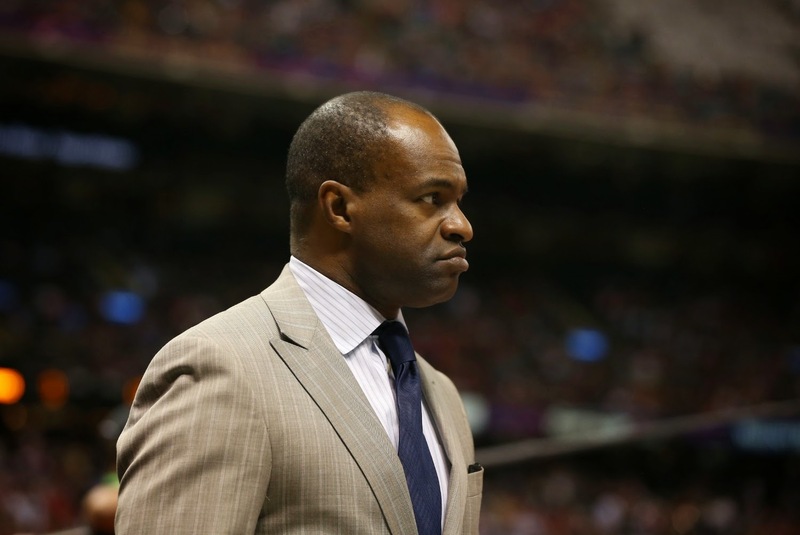 NFLPA head DeMaurice Smith's challengers say his tenure has been a failure. Are they right? When the National Football League Players Association gathers in Hawaii this weekend for its annual meeting, executive director DeMaurice Smith will be on the ballot for reelection—and unlike his unopposed, rubber-stamped renewal in 2012, he'll have seven challengers this time around, an unprecedented number for a union that has had only four executive directors in its 47-year history. The contenders for the March 15 election include former players Sean Gilbert and Robert Griffith; attorneys Jim Acho and Andrew Smith; current and former NFLPA executives Jason Belser and Art McAfee; and even a retired U.S. Navy admiral, John Stufflebeem. All are vying to influence professional football's future, and while each has a unique vision of what that should look like, they agree on this much: DeMaurice Smith has failed, and he must go. Gilbert contends that the lockout-ending 2011 deal with the NFL overseen by Smith will cost players $10 billion over a decade. Stufflebeem believes that Smith's oft-frosty relationship with league commissioner Roger Goodell has been counterproductive. Acho thinks Smith hasn't done enough for player health care. Andrew Smith wonders if the NFLPA itself hasn't been financially mismanaged. A candidate who did not make the union's final executive director ballot, former player Sean Morey, released a detailed and scathing campaign platform that synthesized multiple complaints against Smith, calling for an outside investigation of his tenure; meanwhile, a prominent sports attorney who lost to Smith in a 2009 race for the executive director job, David Cornwell, wrote in a 2012 open letter to NFL agents that he was "stunned at what the NFLPA has become under De[Maurice]," arguing that "the results of his leadership are dangerously inadequate" and concluding that "past is indeed prologue and players should judge De's past in assessing his future." Three years later, 32 union player representatives will be judging Smith's past in order to determine the best way forward. While doing so, they'll have to answer a single question, the same one being asked by Smith's opponents. "The worst deal in the history of sports"
Prior to the 2011 lockout, the NFL made a final offer to the NFLPA that reportedly included guaranteed, incremental increases in player pay. The union said no. Smith subsequently called the proposal "the worst deal in the history of sports." In retrospect, he may have spoken too soon. Two years ago, Ben Volin of the Boston Globe evaluated the 10-year pact that Smith spearheaded and ultimately signed, concluding that "no matter how you slice it, the owners obliterated" the NFLPA. A prominent, anonymous NFL agent was even less charitable, telling Volin that the union "absolutely failed" its membership by agreeing to "the worst CBA in professional sports history." Hyperbolic? Perhaps. On the other hand, there's no denying basic arithmetic. Smith's deal is far less lucrative than the one negotiated by his predecessor, longtime union head Gene Upshaw, whose unexpected death in 2008 led to Smith's election. Gilbert calculates that compared to the old CBA, the new labor agreement will shift $10 billion from players to owners over its 10-year duration. Morey estimates that the total transfer could be closer to $15 billion—a staggering $1.25 billion loss per season, or more money than the gross domestic product of Tonga, the Solomon Islands and 20 other countries. Whatever the exact amount, the underlying math is simple. Under Upshaw's pact, players received 59 percent of net league revenues; under Smith's deal, they receive 47 percent of the same. What are "net revenues?" Basically, it's all the money made each year by the NFL, minus a set-aside that goes directly into owners' pockets. The set-aside amount varies—in the old CBA, it was roughly $1 billion; in the new agreement, it could be even larger depending on league and team accounting trick—but for players, one number matters most: Smith guided them to a collective 12 percent annual pay cut. The proof is in the salary cap. In the NFL, player compensation is limited by the cap, the size of which is pegged to league revenue: as the latter rises, so does the former. Between 2009—the last year of the previous CBA—and now, inflation-adjusted NFL revenues have grown a healthy 31 percent. Over the same time period, the salary cap has jumped from $128 million to a projected $143 million—an inflation-adjusted gain of 0.38 percent. According to a spreadsheet prepared by Gilbert and obtained from a separate league source by VICE Sports, the actual per-team cap from 2011 to 2014 under the current CBA totaled $497 million; had the players been working under Upshaw's deal, it would have been $575.5 million. As for the cap under the the reported terms of the worst-deal-ever NFL proposal that Smith rejected? It also would have totaled $497 million. ... why would a team pay big money to a free agent when it can simply draft a cheaper, healthier alternative and have him locked in to a near-minimum salary for at least three seasons?While the CBA promises minimum salaries for veterans—$715,000 this year for players with 4-6 years of experience, $840,000 for 7-9, and $940,000 for 10-plus—many times it works against them. In the past, the NFLPA has defended the new CBA by noting that it increases health and pension benefits for retired players, that the salary cap is pegged to rise alongside league revenues, and that the NFL is now required to spend 95 percent of the salary cap in cash over a four-year period. All of these things are true. It's also true that active players have to pay for their share of those aforementioned benefits—the cost of which is shared with the league—by taking a smaller piece of the NFL's overall revenue pie; that franchise valuations according to Forbes increased 40 percent between 2010 and 2014, a collective $13 billion jump that does not account for the recent $1.4 billion sale of the Buffalo Bills; that the Green Bay Packers' net income during the first two years of the new CBA was $85.8 million, nearly quadruple the $22.3 million the franchise netted in the two years before the deal was signed; and that the salary caps in 2012 and 2013 would have been even lower had the union not borrowed against future caps in order to boost it. A prominent NFL agent who requested anonymity told VICE Sports that the timing of those bumps—which were sandwiched around Smith's 2012 reelection as NFLPA executive director—was not a coincidence. "The owners manipulated the money with DeMaurice because it made him look good," the agent said. "They love De[Maurice]. One owner said to me privately that they should put a bronze statue of De[Maurice] outside his stadium." So, who really won the 2011 CBA negotiations? Here's a bottom-line way to look at it: Smith's total compensation from the NLPA increased 66 percent between 2011 and 2012, rising to $2.55 million even as the inflation-adjusted salary cap for his constituents has remained flat. Meanwhile, Goodell's pay package from the NFL went from $11.6 million in 2010 to $29.5 million in 2011 to $44.2 million in 2012—a whopping 280 percent jump, and one that league owners said reflects a "pay-for-performance" philosophy. Again, the agent said, those numbers are not accidental. "Prior to the lockout, Goodell made about $10 million a year," he said. "His average compensation so far in the [new CBA] over $30 million, and he's projected to get paid $300 million over the life of the deal. So if it's $10 billion that the owners took from the players, that's like an agent getting his three percent cut." "I know I don't know everything"
As a longtime attorney who often represents professional athletes—most recently, a group of NFL, NBA, and soccer players who allegedly were swindled in a Ponzi scheme by their former investment advisor—Andrew Smith knows his way around a spreadsheet. So when he decided to run for NFLPA executive director, he began by examining the union's publicly available financial records. 1. In the six-year period before DeMaurice Smith assumed control of the NFLPA, total union receipts rose from $172 million in 2003 to $203 million in 2008, peaking at $317 million in 2007. 2. In the six year period since Smith took over, total union receipts fell from $263 million in 2009 to $168 million in 2014, the lowest non-lockout year total since 2002. 3. NFL business has boomed over the latter six-year period. "I know I don't know everything about everything, because the NFLPA won't let me see their books," Andrew Smith says. "But where is the explanation for that?" Morey says the NFL's retired player pension fund should be in better shape. Co-administered by the league and the union, the plan in 2013 had assets of $1.4 billion and liabilities of $2.8 billion—a funding gap large enough to earn an "endangered" designation from the federal government, and one that Morey estimates could cost every active league player between $60,000 and $100,000 per year over the next seven seasons to close. According to a review of federal records by retired player advocate Jeff Nixon, the pension gap has actually grown during DeMaurice Smith's NFLPA tenure. In a March 3 email to NFL players obtained by VICE Sports, union president and current league lineman Eric Winston wrote that the plan's shortfall is partially due to increased retiree benefits under the new CBA. Another reason? Tepid financial management. Pension funds generally invest in the stock market in order to outpace inflation, with bull markets providing a cushion for the bear markets that follow. Since 2009, the S&P 500 index is up 180 percent. Perhaps unsurprisingly, New York City's pension fund—which covers teachers, firefighters, police, and other government employees—enjoyed an annualized rate of return of 13.4 percent over the last five years, helping it achieve its highest-ever recorded value in 2014. By contrast, the NFL player pension fund posted a return rate of 7.8 percent in 2013. Maybe that's the result of bad luck. Or maybe that's a reflection of the fact that according to government filings, the plan spent a total of $5.1 million on investment advice while paying the same amount to the Groom Law Group, a Washington, D.C.-based firm notorious among retired players for denying pension and disability benefits. Speaking of questionable legal fees, Andrew Smith notes that according to the NFLPA's most recent annual financial filing with the Department of Labor, the union's five highest-paid lawyers—DeMaurice Smith, Ira Fishman, Tom DePaso, Ned Erlich, and Heather McPhee—were paid nearly $4.7 million in 2013-14. Meanwhile, the organization spent roughly the same amount on outside law firms, lawyers, and litigation consultants, including $80,275 to Smith's former lobbying firm Patton Boggs; $830,319 to his former law firm Latham Watkins; and $2.6 million to the Chicago-based law firm Winston and Strawn for "CBA matters." "That's a year when you're not even collectively bargaining," Andrew Smith says. "What are you fighting for? Don't you have an in-house team for that? Aren't you paying them $5 million? Imagine the scrutiny if I left my law firm and went to the NFLPA and then started paying my firm and the people I've worked with all these years to work for the union. I would hope that I would be crucified and vilified for that." "We will not bargain for health and safety," Smith said during an October 2009 Congressional hearing on brain damage in football. Less than two years later, the NFLPA did exactly that. Reduced practice hitting and the elimination of training camp two-a-days were part of the 2011 CBA negotiations—along with a new benefit for cognitively impaired retirees—and in 2012, former union president Domonique Foxworth told the Boston Globe that he was "really happy" players had fought to include "health and safety gains" in the deal. Never mind, of course, that NFL owners appeared ready to make unilateral concessions on the brain trauma front, the better to avoid bad press and additional pressure from Capitol Hill. year. "There was no need for De[Maurice] to stop and grumble and make these grand pronouncements on health and safety issues. All it did was signal to the owners that they could act like they didn't intend to give that up, and therefore get massive concessions from De[Maurice] for doing something that commissioner Goodell was planning to do anyway. "The remarkable thing is that in doing so, [Smith] came up short. These massive economic givebacks were traded for the right to practice in tank tops and tutus." During the lockout, Smith led players away from the negotiating table, instead decertifying the union to pursue costly antitrust litigation against the league. That strategy fizzled, and Smith later told locked-out National Basketball Association players that decertification was not a "silver bullet." More recently, Smith has railed against a NFL personal conduct policy that has allowed Goodell to harshly punish players such Ray Rice and Adrian Peterson for off-field transgressions, telling ESPN radio that the league has been "making it up as they go along." Smith wasn't wrong: NFL player discipline is ad hoc and arbitrary, concentrating too much power in Goodell's hands. However, the only reason the commissioner has such sweeping authority—including the authority to alter punishments and to banish players outright—is because the union gave it to him in the 2011 CBA. The NFLPA's ongoing collusion case against the league is more of the same. Three years ago, the union filed a multibillion-dollar federal lawsuit alleging that the league had a secret salary cap of $123 million per team during the uncapped 2010 season. "Cartels will do what cartels do when left unchecked," Smith said. Again, he was right: evidence suggests NFL owners did have an informal cap, given that they later punished the Washington Redskins and Dallas Cowboys for exceeding it by frontloading player contracts. Problem is, Smith signed off on those penalties—reportedly in exchange for a 2012 salary cap bump that may have kept him from being "fired" by angry players—and also agreed to a provision in the 2011 CBA that releases the league from collusion claims. When Smith was elected NFLPA executive director in 2009, he was in some ways an unconventional choice: a former federal prosecutor turned K Street corporate defense attorney—in essence, a mid-level Washington insider—with little labor or sports law experience. Cornwell was skeptical. His subsequent interactions with Smith only amplified his concerns. He saw Smith request during CBA negotiations that players who tested positive under the NFL's drug policy during the lockout be granted amnesty—even though the lockout prevented player from being tested. He saw Smith give the league permission to punish players for drug, steroid, and conduct violations that occurred during the lockout through a side letter agreement, rather than conducting direct negotiations. In his 2012 letter to agents, Cornwell alleges that the NFLPA failed to investigate "numerous potential violations" of union rules by a high-profile agent who has "been publicly supportive" of Smith. He also writes that Smith accepted a five-game NFL suspension for one of his clients, rookie quarterback Terrell Pryor, based on violations of National Collegiate Athletic Association rules—and then tried to distance himself from the move. "Despite my greatest hopes, my personal experience reveals that De's vision in 2008 was little more than an inside Washington political campaign," Cornwell wrote. "High on style, low on substance." It was a simple request. Or so Andrew Smith assumed. After getting on the ballot for the upcoming NFLPA election, he asked union president Winston for contact information for all 32 voting player reps.
"I was told the NFLPA consulted with outside counsel and that all that information is private and confidential," he says. Smith was incredulous. For one, why was the union consulting with outside lawyers on something so seemingly innocuous? More importantly, why wouldn't the organization want Smith contacting player reps, the better to have a more informed electorate? Given that opposing candidates DeMaurice Smith, Belser, and attorney Arthur McAfee all work or have worked at the NFLPA—giving them access to player contact information—how could the union deny Smith the same, and then claim to have a fair and impartial electoral process, the kind of "democratic governance" called for in the group's constitution? "The response I got was, 'De[Maurice] Smith won and he didn't have access to them,'" Andrew Smith says. "So it shows that it's possible." Dissatisfied, Smith reviewed the Labor-Management Reporting and Disclosure Act, the federal law governing union elections. "Lo and behold," he says, "it says I have a right as a candidate to inspect the voters." He says he brought that up with the NFLPA, and subsequently received a letter from a Philadelphia law firm on the union's behalf, telling him that he was wrong about the law. "They said I have a right to inspect the information, that I have to physically go into their offices and look at it," Smith says. "That's semantics," Smith says. "They're making it virtually impossible for me to communicate, making me dive through hoops. They don't want transparency. They don't want change." Smith's frustration isn't unique. Multiple sources—lawyers, agents, journalists, current and former players—have told VICE Sports that the NFLPA under DeMaurice Smith often has been opaque and unresponsive. In his 2012 letter, Cornwell wrote that the union did not respond to initial inquiries about Pryor, and that when he called Smith directly, he was told that the executive director was "on vacation for the month of August." Cornwell also wrote that "players were not fully and fairly informed about the new CBA," but instead given "misleading information." A player agent expressed a similar sentiment to the Boston Globe, stating that "there was never any transparency from the union to the players" about the labor agreement. "It was basically, 'We've agreed to terms on the deal, we expect everyone to ratify it, and let's pop champagne bottles,'" the agent said. "De[Maurice] Smith was a slick trial lawyer who came in and sold the players on a fancy PowerPoint presentation. Ninety-eight percent of the players have no understanding how bad this deal is." Later this year, CBS's 60 Minutes plans to air an expose of the NFLPA's troubled financial advisor registration program, which purports to screen advisors and identify red flags but has failed to prevent multiple players from being ripped off. A source told VICE Sports that the network is delaying its broadcast until after the union election. On Wednesday, Bleacher Report NFL writer Jason Cole wrote on Twitter that the segment is "expected to be highly critical" of DeMaurice Smith. "Players are woefully uninformed about just how bad this financial advisor program has been and how little their union actually does to protect them in this realm," says Yahoo Sports reporter Rand Getlin. "Over the past four years, I've personally written a number of extremely detailed articles that cover $70 million in alleged investment losses that came at the hands of NFLPA registered financial advisors. But the past 22 times I reached out to union spokesman George Atallah for comment on stories where the union arguably failed their players, I've gotten crickets in return. "Don't you think at some point he'd say, 'hey, we're concerned. Saw what you wrote. Can you share any of the information you didn't print that might help us to better protect our players?' You've got a reporter who clearly has a vault of information regarding financial impropriety that, in many cases, is ruining your players' lives, and you don't express any interest in finding out exactly what he knows? To me, that's a prime example of their negligence." Before Morey announced his NFLPA executive director candidacy, he sent a six-page letter to Winston, asking for an extensive list of documents and asking detailed questions about the organization's legal relationships, pension plan, health care programs, staff compensation, and more—the sorts of things anyone trying to lead and improve a multimillion-dollar organization needs to know. Winston denied the request. He did not respond to a VICE Sports email asking about the denial. When a number of DeMaurice Smith's challengers said in a VICE Sports story—full disclosure: written by yours truly—that the union had not given them basic information on finances and other important business matters, Winston sent an email to all NFL players stating that the article was "inflammatory and false" and containing information from the union's finance team that purportedly "explained and corrected" the story. VICE Sports sent Winston a list of questions about his email. He did not respond. On Twitter, NFL kicker and current union executive committee member Jay Feely also took issue with the article, stating in a tweet that executive director candidates were not given access to union financial information because they "didn't ask." Andrew Smith says he subsequently sent Feely an email asking to see the union's books. "He referred me to Winston," Smith says. Speaking via videoconference to attendees at a sports law conference on March 6, DeMaurice Smith sounded sanguine about the upcoming election—joking that his job was "boring" and that his wife was "doing most of the campaign work for every other candidate" before stating that his opponents "don't sit in judgement of De[Maurice] Smith. They're going to sit there and be in judgement of our player leaders." According to Stufflebeem—the former NFL punter and Navy vice admiral running for executive director—Smith's tone was different at a retired player convention in 2012. "De[Maurice] was fielding questions, and I was in the room," Stufflebeem says. "He said, 'this is the best job I've ever had and I intend to keep it for life. And I'll knife fight anyone who tries to take it away from me.'" "He was straight-faced," Stufflebeem says. "Very confident. Very cocky. A lot of my colleagues and I just shook our heads and said, 'wow.'" Are Smith's challengers involved in a knife fight? In order to appear on the NFLPA ballot, candidates must receive written endorsements from three player reps. One contender told VICE Sports that he scored two verbal endorsements immediately after announcing his bid. "I spent five weeks trying to get a third," he says. "A couple of prominent NFL writers told me that players were told by people at the union not to endorse me or Sean Morey. To keep us off the ballot." "I will say I've talked to some current players and some player reps," Stufflebeem says. "They have told me that they were told by members of the executive committee and staff at the NFLPA not to support certain candidates. "I don't know if that's shady. I call it Chicago politics. That's the nature of this beast." Of course, Smith isn't a Chicago politician. He's a Washington lawyer. Appearing on ESPN last August, he gave the equivalent of a campaign stump speech—or perhaps a Sunday morning cable news spin session—offering a full-throated defense of his tenure. Asserting that players were responsible for both the "success of this union" and the 2011 CBA, Smith said he was "extremely pleased" with the deal, as the salary cap had "increased dramatically." He also said he was "looking forward" to the upcoming election, because if players "make a decision they want to go somewhere else, that's the beauty of a transparent and player-run system." Players aren't the only ones judging Smith. The NFL is, too. Thirty-two owners. Goodell and his team. Do they see a worthy adversary? A shrewd opponent who nevertheless deserves respect? A man—and organization—worth doing business with at the big boy table? Cornwell fears otherwise. "Rather than advancing the partnership between players and team owners," he wrote in his 2012 letter, "the new 10 year CBA relegated NFL players' status to mere employees." An advisor to Morey insists the NFLPA's long-term standing is even worse. Forget the CBA clawbacks, he says. The real genius of the deal was to lay the groundwork for a Hollywood-style star system in the league: a few players on every team earning enough money to set up their families for generations; most others making just enough to have to keep working; no one with much incentive to strike. The next time league owners come to players and demand more concessions, what will they find? A union that isn't, well, unified, with rich players pitted against poor, retired players pitted against actives, organization staff pitted against their constituents, and DeMaurice Smith pitted against everyone, maneuvering his way to a lifetime appointment. "I stand in awe," the advisor says. A sports attorney with extensive NFL experience who spoke to VICE Sports was more blunt. "Players," he says, "will entrench themselves as fools with the owners if they re-elect [Smith]."